I used this map when writing The Standing Dead. It shows some of my earlier notions. For example the Earthsky was originally called the Undersky; the Upper Reach was originally the City of Hides and the Koppie was not only much further east than it ended up, but I was also at that time using the Afrikaans spelling, “Kopje”. 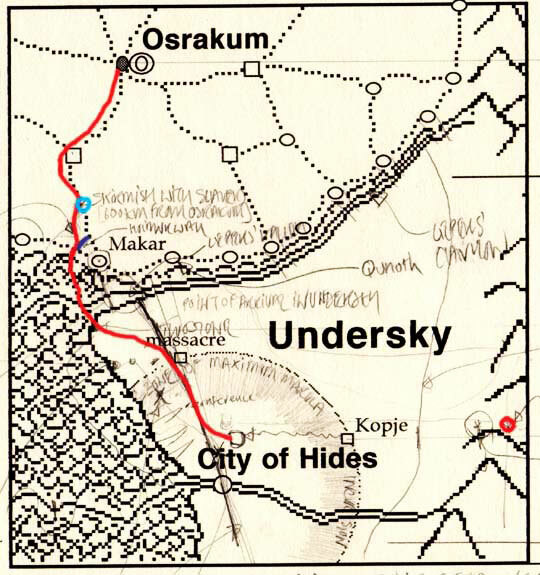 I have included this map on my site to show the route (the red line) that Carnelian and Osidian take from Osrakum to the Koppie. From the camp the slavers make the first night, it moves west of the Great South Road, crossing another road that runs into the west. Sometime after that, the slavers move back onto the road. The point at which they run into the Plainsmen is marked with a blue circle. Thereafter they go cross-country towards Makar. The dragon scouring line is shown in purple. It is when they encounter this that they pass through the Ringwall and out of the Guarded Land. The crossing of the swamp is approximated. Their route is not so direct. 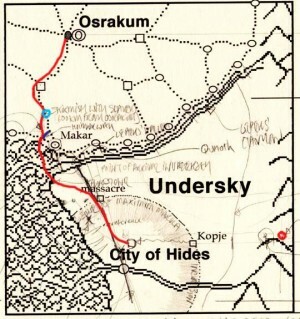 The point at which they come up onto the Earthsky plateau is shown, as is the route that they take from there to the koppie of the Twostone which is labelled “massacre”. From there they follow the Backbone south until they reach the Koppie. Also of note is the valley in the mountains to which the Ochre migrate every year, and that is marked with a red circle.